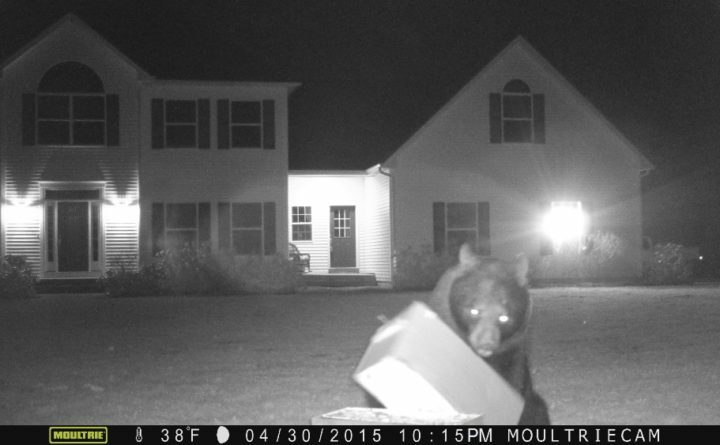 A black bear investigates a hive at Peter Cowin's Hampden home. For bees to make honey, it’s all about location, location, location — and some good weather. For the past month honeybees in the region have been frustrated by the annual dearth. During this time many plants are in flower, but very few of them produce much nectar. This means most hives have been losing weight as they consume honey stores made earlier in the summer. There are exceptions to this, especially where farmers have planted a good expanse of buckwheat, often used as a cover crop. The beekeeper needs to be mindful of an unusual consequence of their bees working a field of buckwheat. It only takes buckwheat 40 days from sowing to flowering, and the plant can produce a lot of sugary nectar. Bees will very excitedly work the buckwheat all morning and be as happy as can be. But once midday comes, the buckwheat flower closes its nectaries and dries up for the day. This leaves the bees mightily ticked off. The frustrated bees return to the hive and sulk all afternoon, and woe betide the beekeeper who decides now is the time to open the hive. The following day the nectar flows again, and happiness is restored — until noon, anyway. Despite the daily interruptions to the nectar flow, the bees can produce a vast amount of honey on buckwheat. Buckwheat honey is dark and very strong tasting. I would dearly love to find a local farmer or two who would like to plant some acres of buckwheat next year, particularly if this is timed to coincide with the summer dearth when my bees have nothing else to forage on. Late August and early September usually see a fall honey flow from goldenrod. The goldenrod flow can also produce a lot of honey under the right conditions. Three falls ago, my bees were packing on 50 pounds of goldenrod honey per week, per hive. For the past two falls, however, the local drought resulted in goldenrod producing little to no nectar. The lack of a fall honey flow is very bad news for beekeepers. The stress, because of poor nutrition, predisposes the bees to viruses brought in by mites. The beekeeper also needs to feed their hives sugar syrup to make up for this shortfall and to allow them to store food for the coming winter. Last fall I had to feed my 70 hives more than 3,000 pounds of sugar. This fall the goldenrod flow is really patchy. In some areas like Orrington I am hearing about bees putting on a super of honey a week. Here in Hampden my bees are looking pretty frustrated. Since moving to my new house on Main Road South in Hampden two years ago, I had gotten away with having no electric fence around my hives. A few weeks ago that good run came to an end when I found one hive tipped over and the combs of honey scattered around the place. Bears love honey and will also eat the combs full of protein rich bee larvae. In this case, the bear settled for just some honey before the occupants of the hive drove him off. When I discovered the hive on its side, I suited up and went out to repair the damage. The one deep brood box was unharmed but laying on its side. The bees were very angry — as soon as I moved the box back onto its stand, several hundred attacked. It pays to have a decent bee suit when this happens. Normally, a bear will keep coming back as long as there is food (or beehives) there to eat. So, the electric fence went up round the apiary and to date, no more issues. As we go into the fall, preparation for winter is on the beekeeper’s mind. A regimen of mite treatments should be underway, entrances reduced to stop robbing, honey stores should be adequate, winter insulation will go on before the snow, mouse guards on lower entrance, adding an upper entrance, and possibly adding winter feeds. Fall and winter are the most likely time for hives to die. Time spent on preparation is rarely wasted. It’s my aim to establish as many new hives and as many new beekeepers as possible. The more beekeepers we have the more likely we are to maintain a steadier honeybee population. But of even greater importance is the need for beekeepers to understand what is killing bees and the things we can do to prevent this problem. Keeping parasitic mite levels low is the single biggest thing we can do to help our bees, particularly in late summer and fall. This has been particularly important with the dry summers and long, warm falls we have been having. Mites account for 90 percent of honeybee hive deaths. Treating hives for mites monthly is becoming the new norm. Last winter, the cold was also a major factor in bee losses. This year for me I have made an overhaul of the genetic stock to have bees better able to cope with cold winters and bees who can recognize and deal with mites without the beekeepers help. Firstly, I have been bringing in queen bees from a breeding program in Canada (via their satellite operation in California). This strain is referred to as Saskatraz bees, which refers to the Canadian state of Saskatchewan where the project is being run. The project, which has been running for about 14 years, starts by selecting the best hives from tens of thousands of honey production colonies. Of these, hundreds each year are sent to the breeding station is remote Saskatchewan referred to as Alcatraz, as it’s a life sentence with no mite treatments. Hence the name, Saskatraz. Over the years, the surviving colonies, showing some ability to resist mites, become the breeding stock. Being located where they are, they also need to cope well with cold winters. In parallel with this, I have been breeding from some of my own queens from my very best hives who survived our own terrible winter. The queen rearing program I have started here is in conjunction with the “Sweet Spot” husbandry program being run by the University of Maine and College of the Atlantic. For a few months I am getting the assistance of a recent COA graduate, Marianna Mead, who is learning aspects of queen rearing and general bee husbandry, developing a road map of sorts for other beekeepers interested in queen rearing. So far, we have reared dozens of local queens which are being introduced to many more of my hives. Between these two strains of queen, I will replace all of my queens this year. Hopefully, this will be a big step in the right direction to having locally reared, winter hardy and more mite resistant honeybees. The more beekeepers who adopt mite resistant strains of bee the fewer hives will die from mites or infect other beekeeper’s hives with mites. Perhaps with time, mite treatments will no longer be needed. This year, I will run a special one day intermediate and fall management class at my store to help newbies prepare their hives properly. As usual at this time I will also teach a number of beginner and intermediate classes through adult education as well. — Presque Isle – Beginners: 9 a.m. to 2:30 p.m., Sept. 8. Call 207-764-4776 or visit http://msad1.maineadulted.org/. — Hampden – Intermediate and Fall Management One Day Hands-on Class: 8 a.m. to 2:30 p.m. Saturday, Sept. 22. Call 207-299-6948. — Orono – Beginners: 6-8:30 p.m. Oct. 1 and Oct. 15. Call 207-866-4119 or visit www.orono-hampden.coursestorm.com. — Ellsworth – Beginners: 6:30-8:30 p.m. Oct. 2, Oct. 9 and Oct. 16. Call 207-664-7110 or visit ellsworth.maineadulted.org. — Bangor – Beginners: 6:30-8:30 p.m. Oct. 3, Oct. 10 and Oct. 17. Call 207-992-5522 or visit www.bangoradulted.org. — Bangor – Intermediate: 6:30-8:30 p.m. Oct. 22, Oct. 29 and Nov. 5. Call 207-992-5522 or visit www.bangoradulted.org. — Mount Desert Island – Beginners: 6:30-8:30 p.m. Oct. 24, Oct. 31 and Nov. 7. Call 207-288-4703 or visit https://mdi.coursestorm.com/course/beekeeping-101-f16?search=bee.